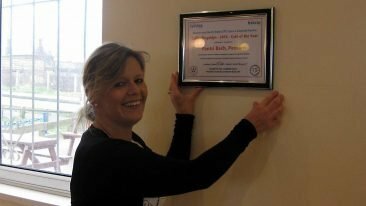 As Storm Doris was winding up along the North Wales coast on Wednesday 22nd February 2017, President of CTC Chester &North Wales (CyclingUK) Mike Cross presented its annual catering award to Julie Williams, joint owner of the Pantri Bach cafe on Pensarn promenade. 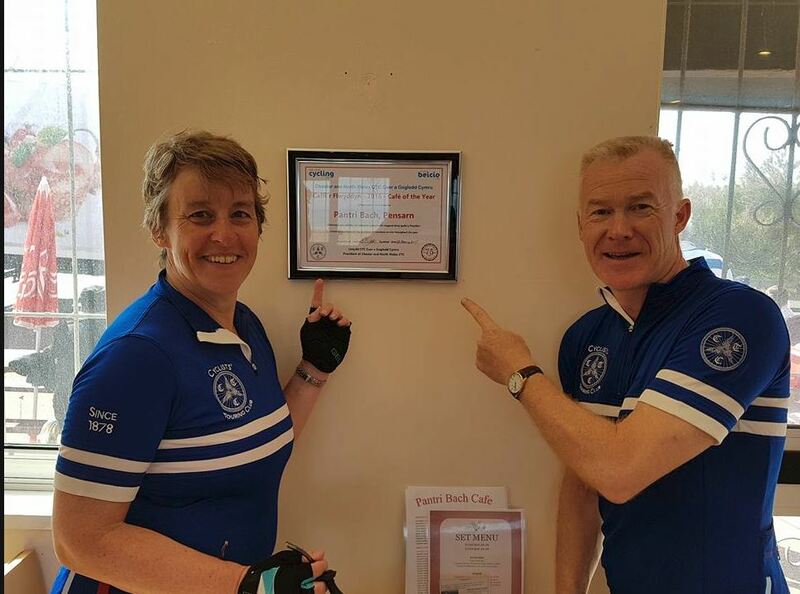 Together with a gathering of appreciative customers, cafe manager Kirsty Prosser and her staff looked on, cycling clubs Rhos on Sea and Ruthin were also represented. Introduced in recent years, for the first time this award has gone to a cafe in Wales. 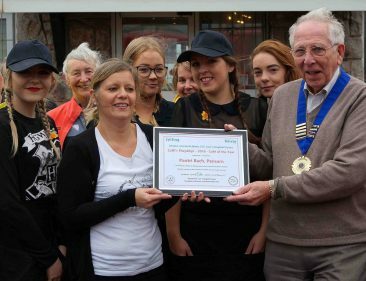 It is aimed as a big ‘THANK YOU’ to the proprietors and staff of the many cycle friendly establishments to be found around Cheshire and North Wales. In 2015 the award went to the Meadow Lee Farm Coffee Shop at the end of the Mickle Trafford Cycle Path in Cheshire. This year Cleopatra’s at Holt in Wales was pipped to the post. Ten cafes were nominated. As the winner cannot be considered for another five years, there’s every chance Cleopatra’s or one of the other establishments could be first past the post for 2017. 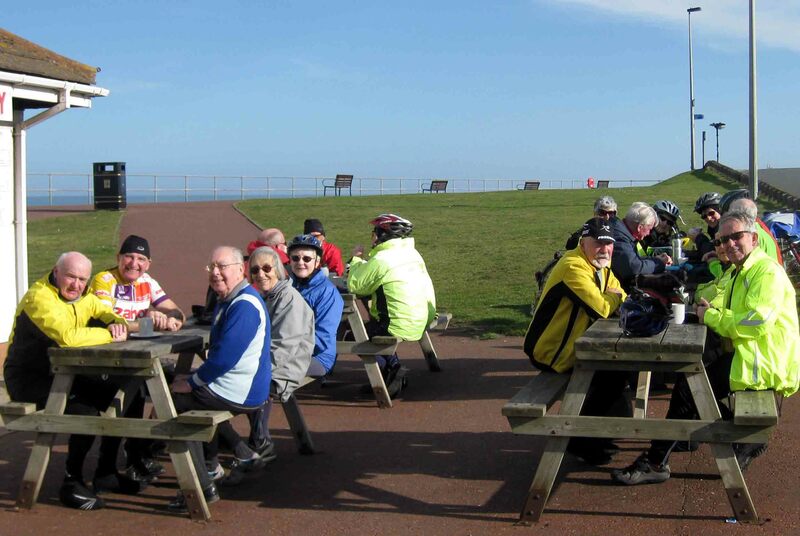 Apart from the regulars, Pantri Bach is also popular as a watering hole for touring cyclists. On one occasion the Namibian national rugby team dropped by to mingle with the riders (below). 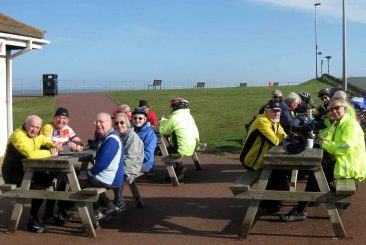 For many years Audax events have also found it pleasant and convenient to replenish energies there. Cycling UK CEO Paul Tuohy during a May 2017 Relay Ride. Excellent news, I hope/aim to be there! Thanks John. See you there – if not before. Thank you Roy and well done Pantri Bach! Sorry I can’t be there. Have a great time. Thank you Mary. Sorry you can’t be there. Your comment appreciated.